Red Young is a pianist, organist, arranger, producer, vocalist and artist. Born in Ft Worth, TX, Red started playing piano at age 3, first classical concert at age 10, played with bands and accompanied vocalists throughout high school and started playing Hammond organ at 16. Over his 45 year career he has recorded and toured with a wide variety of artists: Freddy Fender, Sonny & Cher, Noel Redding, Dolly Parton, Tanya Tucker, Eric Burdon, Linda Ronstadt, Nelson Riddle to name a few before he started his own groups. He lived in Los Angeles from 1977 and 2002, and been on TV shows, Movies, performed and written for orchestras, bands and artists, and produced arranged, sang and written on many projects including 160 albums. He has 4 albums out with his own groups he has led and several organ albums under his own name with and more on the way. After moving to Austin in 2002 after 25 years in Los Angeles, Red worked with Marcia Ball, Stephen Bruton, Delbert McClinton and many others including his own groups. Since 2006, Red spends part of his time touring with Eric Burdon and the Animals throughout Europe, Canada and the USA (he also recorded on 2 albums since he joined Eric). The rest of the time he spends at his home in Austin and works regularly in Austin and throughout Texas where his own band, Black Red Black and his Organ Trios, Quartets and Quintets draw great crowds. 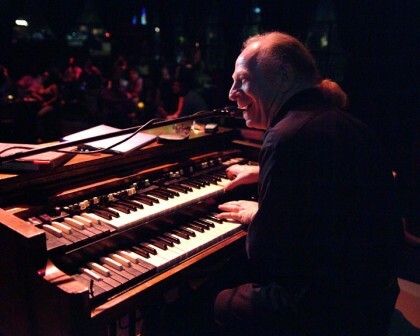 He has played Hammond B3 since 1970 (bought his first one in 1971) and owns several Hammonds at the present time in various clubs around Austin. He has his own studio in Austin that is his home base and he records for clients all over the world.